Prime Minister and Minister of Finance Perry Christie said March 17 that Bahamians must still work hard at bridging their differences–political and otherwise–and be able to recognize when to “let go and come together” in a national context. “Those of you who have participated in the public life understand the importance of nation building and that it does not take one political side or even two political sides. 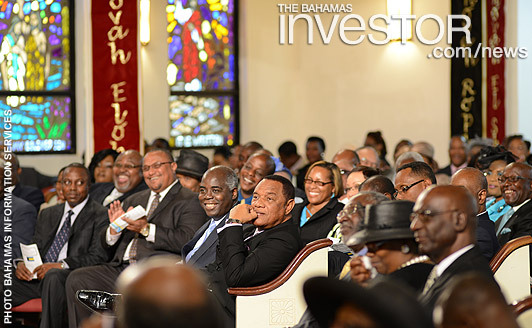 It takes the entire country,” Prime Minister Christie said during the Service of Thanksgiving for the Official Launch of the 40th Anniversary of Celebrations on Grand Bahama, held at Jubilee Cathedral, Settlers Way, Freeport. Among the Cabinet Ministers, Members of Parliament, senior government officials, civic and religious leaders and stakeholders present were Deputy Prime Minister and Minister of Works and Urban Development Philip Davis, Minister of Tourism Obie Wilchcombe, Minister for Grand Bahama Michael Darville, Senator Tanisha Tynes, national co-chairman of the Independence Committee Charles Carter, Grand Bahama co-chairmen of the Independence Committee Mary Culmer and Peter Adderley, Grand Bahama Christian Council (GBCC) president bishop Arnold Pinder, GBCC vice president pastor Keith Meadows and host pastor bishop Godfrey R Williams. Prime Minister Christie said that the 40th Independence Celebrations could be one of the final opportunities for those who took the country through independence and are still alive to interact with those younger Bahamians who now chart the future. “The big tragedy of our country is we do not know its history and we do not speak often enough about it,” Prime Minister Christie said. Prime Minister Christie stressed that Bahamians must work hard to connect all the islands, ensuring that the same level of inspiration and patriotism that exists in the larger cities exists throughout the whole archipelago. BEMU contributions to health and pension plans and a possible hike in the price of building permits top the news at the start of the week in The Bahamas.